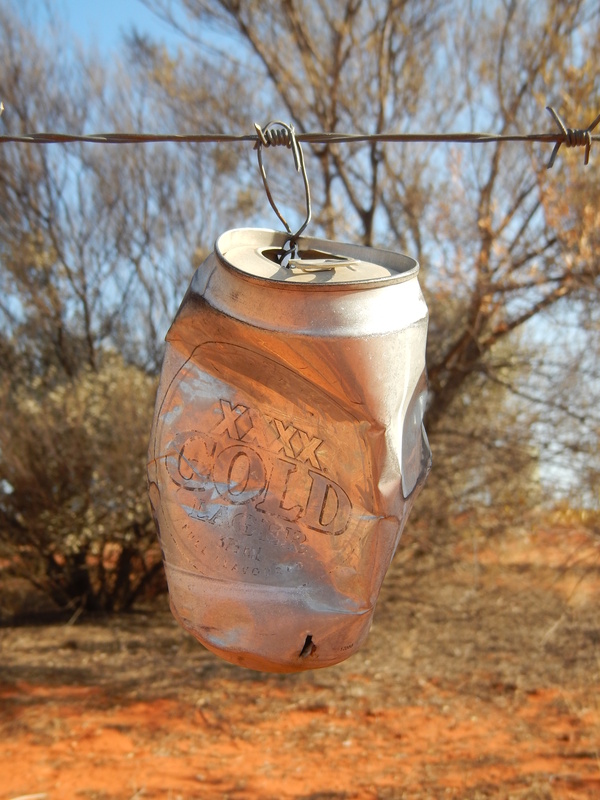 I love this shot of a battered XXXX Gold beer can attached to a fence in the middle of the Australian outback. I hope someone enjoyed consuming its icy-cold contents before it was re-purposed to dangle like an earring on this fence, or perhaps I should say necklace, as there were cans strung along the length of the wire fence. Its on Kings Creek Station, an outback cattle and camel farm near Kings Canyon in the Northern Territory. The station covers 1800 sq km and is the largest exporter of live camels in Australia. I stayed at the property, in one of their tented safari cabins, while driving from Alice Springs to Uluru and came across these cans while hooning about on their quad bike adventure dodging mulga ant nests, desert oaks and skittish cattle. The cans are hung to make the fence wires more visible from a distance (they tend to meld into the background) so stockmen don’t go hurtling into them when mustering. They certainly make you long for a cold beer on the hot and dusty track though. This entry was posted in Accommodation, Adventure, Australia, Northern Territory, Outback, Postcards, Road Trips, Travel and tagged accommodation, Kings Creek Station, outback, Quad biking, XXXX Gold. Bookmark the permalink.